David M Preston lives in Hertfordshire, UK. He spent most of his childhood in Kenya, and as a child he sung in choirs and learnt the piano and ‘cello, later taking up the guitar in his student days. He did not have any formal musical training after school but continued to play music for pleasure. David is a doctor and has worked as a consultant gastroenterologist for 25 years. He has recently given up his medical career to concentrate on recording these songs. The music on these albums is just part of an extraordinary outpouring of songs that began about four years ago. David was woken one night at 4am by a song in his head that was complete. Not able to sleep, he went downstairs to write it down. The result of this was ‘I Stand in Awe’ – probably David’s most popular song from his first album. David had no previous experience of music coming in this way and has never trained in songwriting or composition. To his astonishment more songs followed, mostly at night until after seven weeks he had 50 more. Then he began to write more classical styles of music as well, including a complete mass and many hymns and carols. That was not all. One day he found that he could play the music in his head by ear on a piano (never having had such a gift before), but only his own music and not pieces by other composers. Later he started writing songs in Swahili, a language he knew a little of as a boy, but had forgotten. He is now also writing in French, as well as translating some of his English songs into the same language. David’s music does not come as fast as it did in the beginning, but he has received over 200 songs in three years and plans to release a selection of these on four albums. The first three are now available on this website. David has been a Christian since the age of 20 and is currently a member of the congregation at Christ Church, Ware. 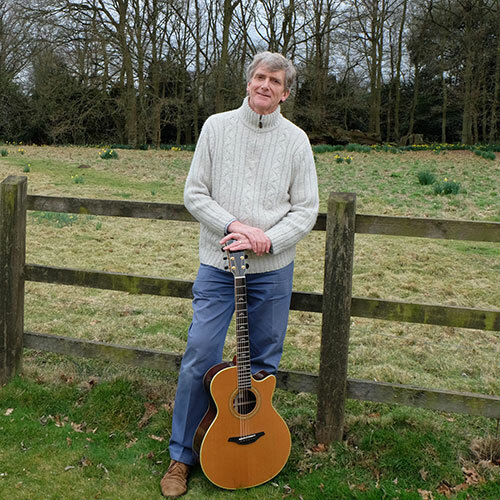 He has spoken about this gift in churches around the country and is available to come to other congregations to share his story and play some of the songs. If you would like him to speak at your church, please do get in touch.